The Lost Cases of Sherlock Holmes is rated 2.9 out of 5 by 14. Rated 5 out of 5 by qpqt from Sherlock's Getting a Bad Rap OK, some of the objects are small and some are ridiculously hidden. But if you manage your hints, you'll be able to get through each case. Each chapter is timed. I generally HATE timed games. But I like this one. And, again, if you are careful with your use of hints and use them wisely, you'll be fine. The graphics are very good. And the objects pretty much relate to the time period -- late 1800's. There are no laptops to find, no cars, no telephones. Each case is its own little short story, so I don't see how you could get bored. And the mini games are varied, so you're not doing the same mini game over and over. You visit new locations for each case, except for Baker Street where you return each time to figure out the identity of the culprit. I gave this game 5 stars partly because I really like it and partly to counteract the bad reviews, which I think are undeserved. But to each his own. I have given one star reviews to games that have a 4 or 5 star average rating. Rated 4 out of 5 by Mastermac59 from Great Detective game Very great game with different stories. Playing with magnifier is fun. Highly recommended. Rated 4 out of 5 by coffeyfan77 from Solid Detective Work Lost Cases is a Sherlock Holmes-themed game presenting cases you and Dr. Watson must crack. In each of the cases you will be presented with different areas to search. Finding the differences or given clue items will result in suspects being unveiled. Once you've identified all suspects, you'll play a matching and concentration game to confirm your evildoer. Holmes will then explain what happened. There is plenty to like here, especially for the Holmes buff. 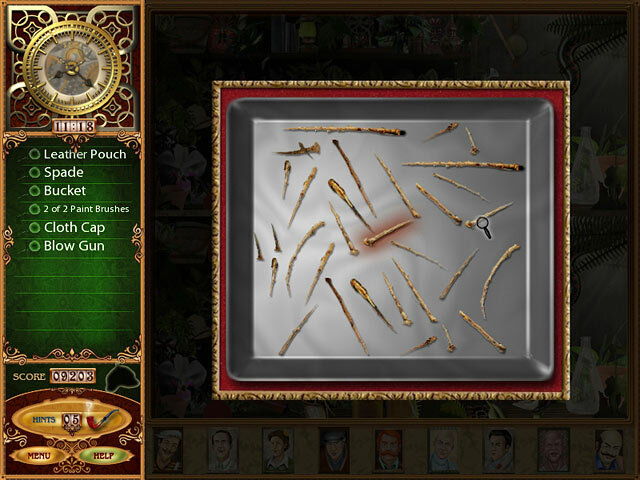 Cases are right in line with typical Sherlock fare, and there are minigames divided up within the cases to make the game a bit meatier. Difficulty level is decent. Hardest thing will be picking up the objects, as scenes are cluttered and you'll have to make use of a magnifying glass. I also liked the ability to find a Sherlock cap somewhere in each case to unlock a bonus chemistry feature, though the reward itself is rather underwhelming. Voice acting is solidly done, and you'll meet a couple of the famous Holmes characters along the way. It is repetitive and not exactly a way to demonstrate his famous deductive skills, but I had a great time working on a wide variety of cases. Highly enjoyed. Rated 4 out of 5 by kathiep53 from pretty challenging game Items are very small even with magnifying glass, but it was still fun to play. Mini games are really fun. I don't really like games with time limits , but with the help of hints there is usually enough time. It seams to be a pretty long game ( not finished yet ). 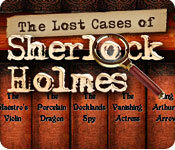 Rated 3 out of 5 by rosekaufmann from Easy Sherlock There are 16 cases to solve, each with a time limit. Game lasts about 4-5 hours. 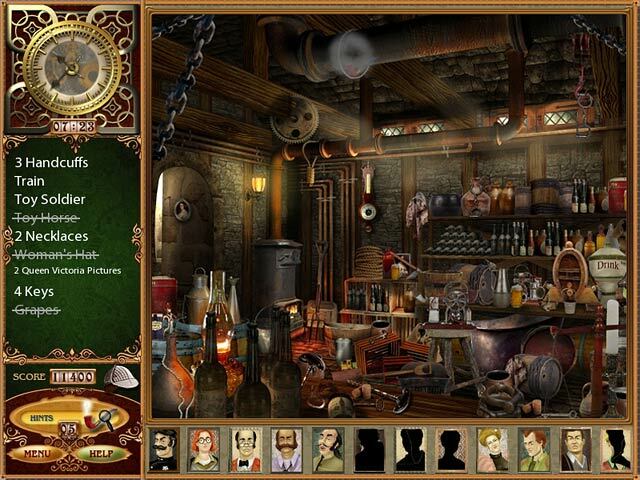 Cases generally include various puzzles and HOS, ending with a mini-game identifying the guilty part. The puzzles and HOS in each case are nicely tied to the story. Items are not difficult to identify and fit into the scenes. Find a Sherlock Cap in each book and unlock a bonus chapter. Earn extra hints by finding a Sherlock pipe in each scene. Fun game, even though solving the crimes is simplistic and quite easy. No annoying traveling. Overall, game has a British feel. Animation is stiff and artwork was bland, though that may be the look for which they were aiming. You can easily stop and restart playing at any point. Once you've played the game, it may be too easy to hold your interest the next time. Rated 3 out of 5 by AutismMom00 from VERY Elementary, indeed. I like challenge, but this was too easy for me. The only time I had to use the hint button was because I had trouble seeing objects even w/the magnifier. The process of elimination was too easy for each story. I think for a tween, (11-15 or so) it would be great, but I was bored. Too bad, because I love the logic of Holmes. Also, the characters and the graphics were just so-so. I have seen worse, but I was not impressed. Recommend for an older juvenile, but unless you are just looking for a time filler without a hard challenge, skip this one. I won't be buying it. Rated 3 out of 5 by lauramiller1982 from OK Was worth the time, but a bit repetitive. Rated 3 out of 5 by samanthakorrinn from Not the Most Entertaining Game Once I completed the first "case" in this game, I felt like all the others were essentially identical. Unfortunately, it's not very engaging or entertaining. I'm a huge Sherlock Holmes fan but this game leaves a bit to be desired. Rated 2 out of 5 by Suelovesgames from Wish I Hadn't Bought It This had so much potential to be a great game but it fell short in many ways. I ended up getting half way through and I was so fed up and bored with it by then that I gave up. I always like to complete games, to see them through to the end, even if I'm bored. Most of the game play is tedious. There are many Spot The Difference scenes which I don't like. There are limited hints and you can't skip puzzles. (Well, you can but you have to earn the skips and that's not easy). There are HOS but not enough of them for my liking. The worst thing is, you have to use a magnifying glass to find objects. It's compulsory, you don't have a choice in it. The objects can be difficult to find. I didn't complete it, not because I got stuck but because life is too short to play games like these. However, the storyline, atmosphere, dialogue and characters were all fairly realistic, believable, consistant and fun. There were also very many different stories to play but in the end, that just wasn't enough to keep me interested. 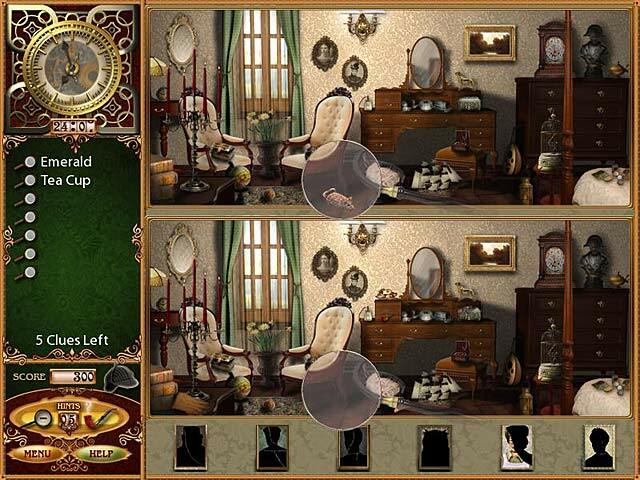 Enter the world of Sherlock Holmes and solve a variety of mystery and mini-games to crack the case in this layered Hidden Object game.